New "Open Top" design for easier winch access! - Open Top design for easier winch access. 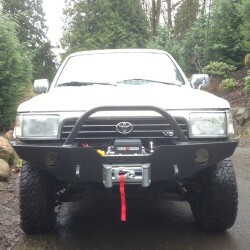 - All internal winch mount parts are keyed and slotted, which means no measuring or headaches!
! !BUMPER KITS WITH BODY LIFT ADJUSTMENTS MAY TAKE UP TO 18 BUSINESS DAYS TO SHIP!! - CNC cut and skeletonized (for weight reduction) 5/16 and 1/4" plate for the inner winch mount structure. --! !BUMPER KITS WITH BODY LIFT ADJUSTMENT MAY TAKE UP TO 18 BUSINESS DAYS TO SHIP! !